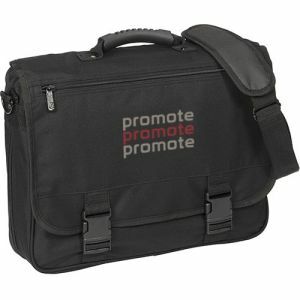 Promotional Laptop Bags are essential travel items on journeys of all lengths, guaranteed to help protect your laptop or tablet while advertising your company logo simultaneously. 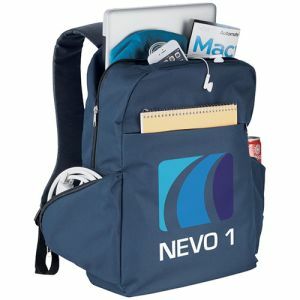 Whether jobs are mainly deskbound or mobile, many businesses give staff the flexibility of a laptop computer to enable hot desking, meeting minute-taking, working on the daily commute - or even at the airport - and that means really good branded laptop bags which can accommodate a laptop or notebook computer, key documents and some personal effects are a brilliant promotional item aimed at a business audience. 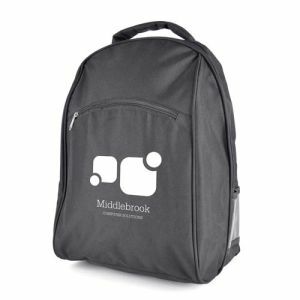 Schools, colleges and universities either issue or encourage the use of iPads/tablets or laptops during lessons or for homework so printed laptop bags are even a great way to get your name out to pupils and students or provide practical support to academic institutions. 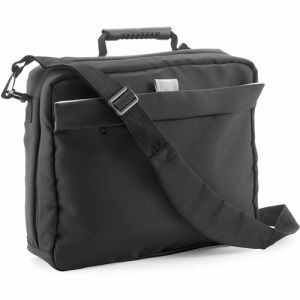 Of Techradar’s pick of the 15 best laptops you can buy this year, 10 are priced at more than £1000, so the business value in terms of equipment, as well as the data they hold, is clearly worth protecting from damage or theft. 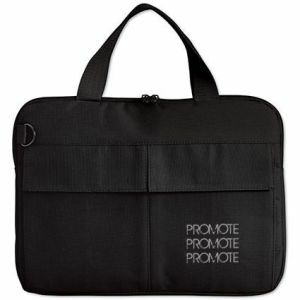 Promotional laptop bags and tablet cases come in a variety of shapes and styles to suit different business and consumer audiences – sleeves, messenger, backpack or more traditional briefcase style bags. 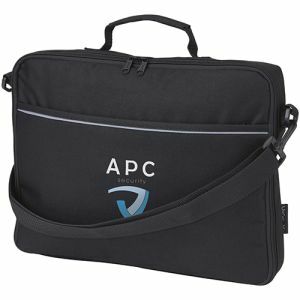 We love the simplicity of our 13-inch laptop bags which come in a stylish dark grey with contrasting interior and stitching colours to tie into your corporate colour palette. 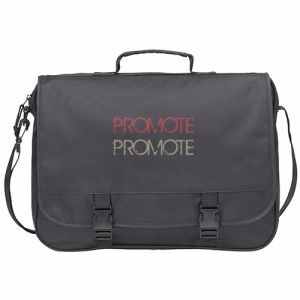 With two external pockets and a shoulder strap, this is a simple, but functional, printed laptop bag which will promote your company wherever it goes. 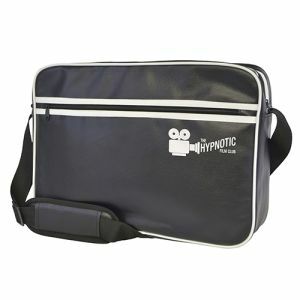 For up to 15-inch laptops, the styling of our retro style zipped laptop bags will have broad appeal to businesses of all sizes. 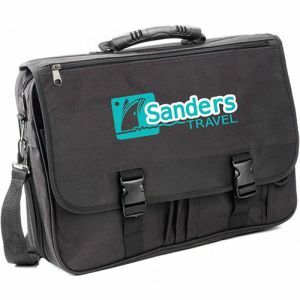 Manufactured from showerproof black PU with white trim, these branded laptop cases have heaps of style and protect larger laptops in a spacious padded compartment. 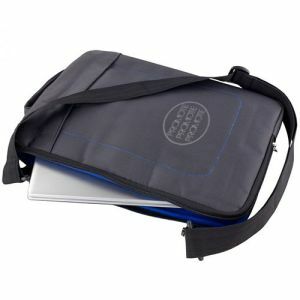 For a multifunctional tough and protective branded laptop bag, you can’t go wrong with neoprene. 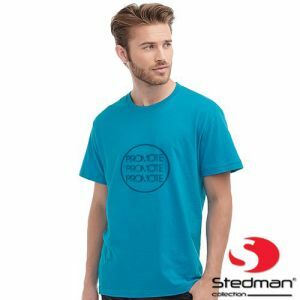 Originally created in 1930, neoprene is a synthetic rubber fabric which is strong and resistant to heat, chemicals, oil and ozone and can hold its own in adverse weather conditions such as rain, hail, wind, snow and sun. 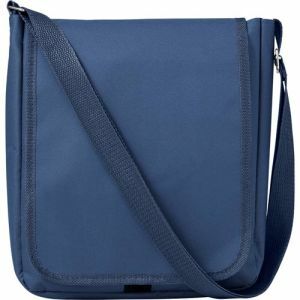 And being a flexible, soft and lightweight fabric, it’s perfect for bags that need to protect valuable computer or other tech equipment. 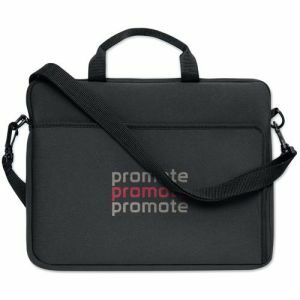 Our deluxe neoprene laptop sleeves can accommodate up to a 15-inch screen and have a top carry handle, or the 14-inch neoprene laptop bags have both a top carry handle and adjustable shoulder strap. 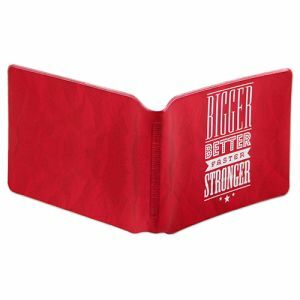 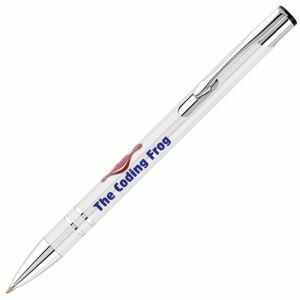 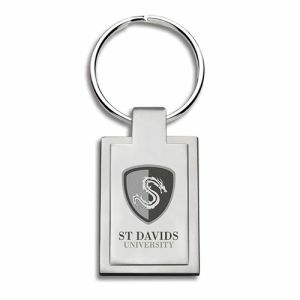 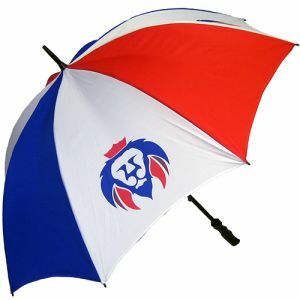 Both have a large branding area to ensure your company logo and name is synonymous with style and function. 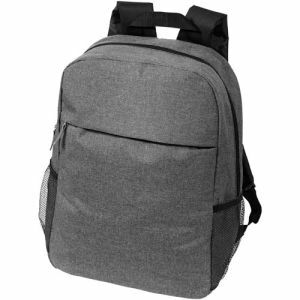 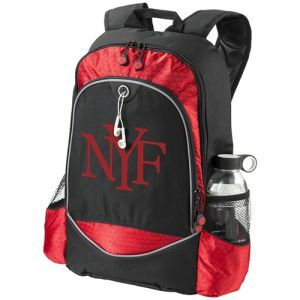 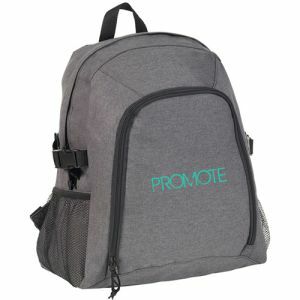 Business travellers and students alike will probably favour a backpack as their ‘promotional laptop bag of choice’ as they are likely to need to carry a lot of additional paperwork, folders or books along with their laptop or notebook computer. 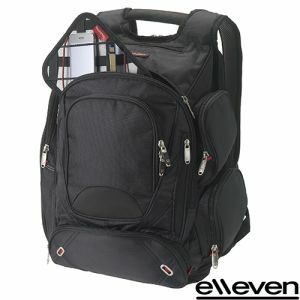 Our most popular backpack style printed laptop case is the Faversham laptop bag available in either black or navy. 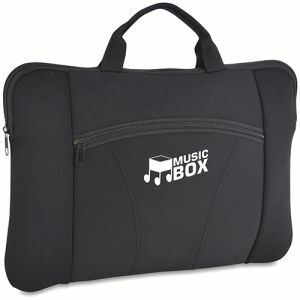 It comes with plenty of compartments and an earphone outlet, so there’s no reason not to stay connected even while tech items are safe and secure, hidden away out of sight. 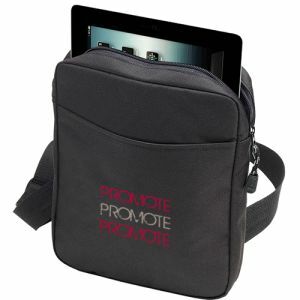 To offer protection for iPads or tablets within the same design to suit a wider target audience, our Borden iPad and tablet PC bags fit the bill perfectly with a cross body style and generous branding area on the pocket in up to full colour. 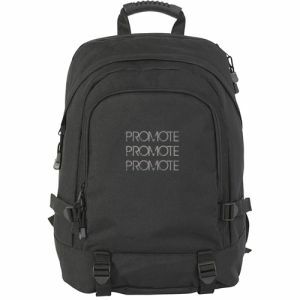 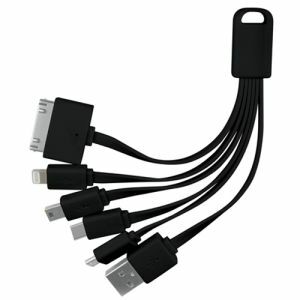 These are a great little giveaway for B2C as well as B2B audiences. 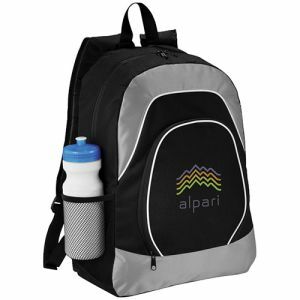 With prices starting at less than £4 we can promise you the best UK prices on corporate branded laptop bags and iPad covers for your marketing campaign. 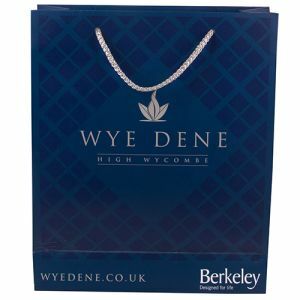 If you've not found what you're looking for, please give us a call or request a sample so we can help get your brand moving with our printed laptop bags.